Following on from our article regarding the reuse of displaced earth, here's the second boring story of the day. 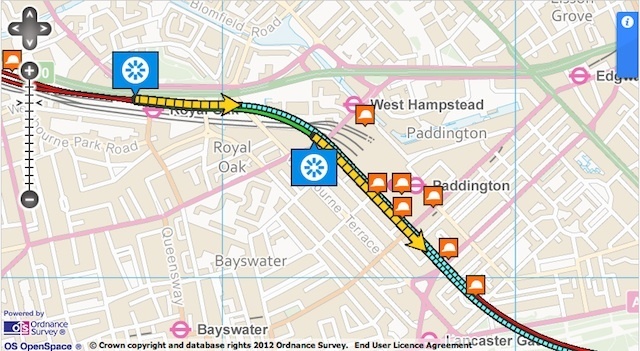 Crossrail is showing the routes of its two tunnel-boring machines on a regularly updated map. The lead machine is currently passing beneath the Paddington area, with its projected course over the next 30 days shown in yellow. If it remains on schedule, it'll be under Hyde Park in 90 days (turquoise line). As well as showing current and imminent progress, you can follow the map to the east to see exactly where the boring machines will tunnel over the coming months. Although the tunneling isn't expected to disturb surface buildings, it appears that West Hampstead station has suffered a quite severe case of subsidence in the map shown above. Thanks to the excellent Mapping London blog for the tip.